Customs and rituals are an important part of the Indian wedding. In order to fully appreciate something, we believe you must fully understand it. In today’s post, we at Mukta Event Managers - Hyderabad's best event managers want to clarify the difference between two very important pre-wedding ceremonies: The Sangeet function and The Mehndi. The term Sangeet is Sanskrit, which when translated into English literally means as sung together. The Sangeet ceremony takes place two or three days before the wedding, and is a Punjabi(Indian/Pakistani) ceremony. In the old days, the Sangeet was reserved for women only, but these days many couples are deciding to have a Sangeet that includes both women and men. The Sangeet is a time for celebrating, singing, dancing and joking. It can include some good-natured ribbing of the couple’s soon-to-be in-laws and it’s also a perfect time for wedding guests to meet and get to know each other. The bridal and grooms party will each learn songs and dances to perform. Traditional Indian instruments, like a dholki (a two-sided drum), are often used in the ceremony as well. After all the singing and dancing is finished, guests enjoy beautiful hor d’oeuvres and sweet dishes. The Mehndi ceremony is about beauty and elegance and symbolizes the Outer and the Inner Sun. The Mehandi is one of the sixteen adornments of the bride and her beauty is believed to be incomplete without it. The ceremony normally takes place just before the wedding ceremony. 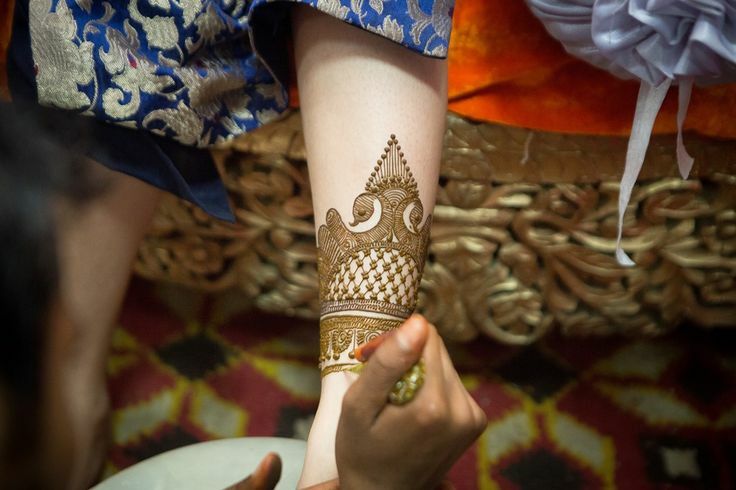 During the ceremony, turmeric paste is applied on a bride’s face, feet and hands. After this, a skilled Mehndi expert applies Mehndi on the bride. Traditionally, the Mehndi applied to the bride was obtained by drying the leaves of the Henna plant. Today, there are many types of Mehndi designs available, including Arabic Mehndi, Rajasthani Mehndi, Cryustal Mehndi, and Tattoo Mehndi. Some people believe that the darker the color of the Mehndi, the more the bride’s husband will love her. The Mehndi ceremony has been a significant part of the Indian wedding dating way back and was even described in the earliest Vedic ritual books. The custom is meant to awaken the “inner light” and so gold of the inner Sun has an important symbolic function. Traditional Mehndi designs draw the sun on the palm.